On the 26th of January Australians celebrate Australia Day. It is the anniversary of the arrival of the first fleet of 11 convict ships from Great Britain in 1788, and the birth of this nation. 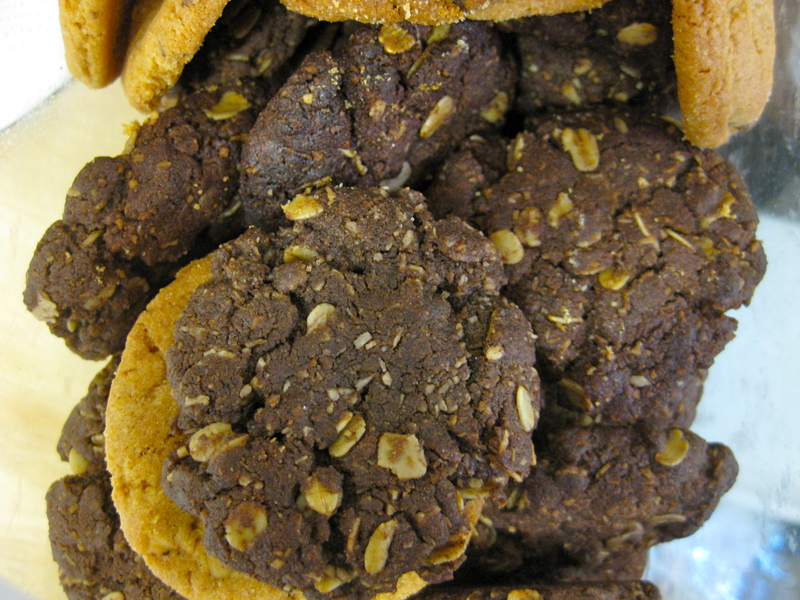 Along with fireworks and BBQs something that usually gets whipped out on this day is ANZAC biscuits. ANZAC (acronym for Australia New Zealand Army Corp) biscuits – it is said – were sent to the soldiers in battle in the World Wars. Because they contain no egg, they kept a lot longer than normal biscuits. We eat them here because we love that golden syrupy crunch. On the suggestion of a friend, I tried making some ANZAC biscuits loaded with cocoa and chocolate chips, mainly in attempt to gets oats into the kids. While not a traditional recipe, this one is more of an ‘inspired by’ affair. It is made using the same method (bi-carb in water) and does not contain eggs, but packs a double chocolate punch. Combine dry ingredients in a bowl (except bicarb). Melt butter and golden syrup in a pot. Combine bicarb and boiling water, add to butter. While the butter and bicarb is still bubbling, pour into the dry ingredients and stir to combine. Roll into balls, flatten and bake till done (about 20 minutes).